THANK YOU to all who came out on a very cold Valentine’s Day to help support The Scholarship Foundation of Wakefield’s Annual Jazz Brunch. We had a great time, with great food, great friends and great music by Hot Sauce Rhythm and Blues. Visit our Facebook Page for Photos of this year’s event. 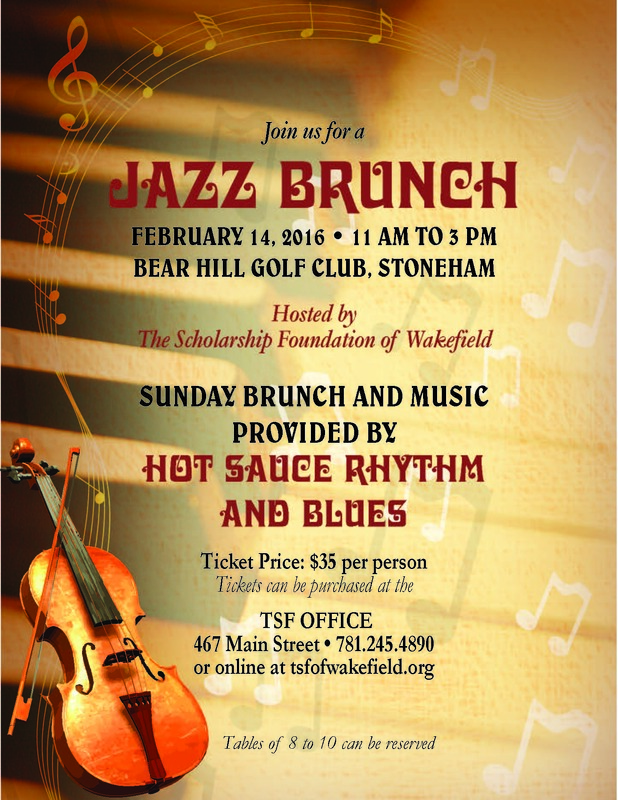 The Scholarship Foundation (TSF) of Wakefield will host a jazz brunch on Valentine’s Day, Sunday, February 14th from 11 a.m. to 3 p.m. at the Bear Hill Golf Club in Stoneham. Tickets are $35 per person and can be purchased at the TSF office on the second floor of the Americal Civic Center, (781) 245-4890 or by MasterCard and Visa on the organization’s website www.tsfofwakefield.org. Tables of 8 to 10 can also be reserved. 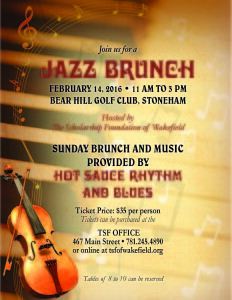 For additional information about the jazz brunch, please email – tsfofwakefield@earthlink.net, or call Roberta DiNitto at the TSF office, (781) 245-4890.